MILFORD, Connecticut (WABC) -- Two young girls from Syria who were on their way to Connecticut when they got caught in the middle of President Donald Trump's executive order on immigration have finally been reunited with their father. The children, ages 5 and 8, arrived with their mother at John F. Kennedy International Airport on Thursday night, after being separated from their dad for two years. The trio was traveling from Jordan to the U.S. on Saturday when the news broke of Trump's decision to bar all Syrian entries. Despite having all the proper legal documents, they were prevented from boarding their connecting flight in Kiev. 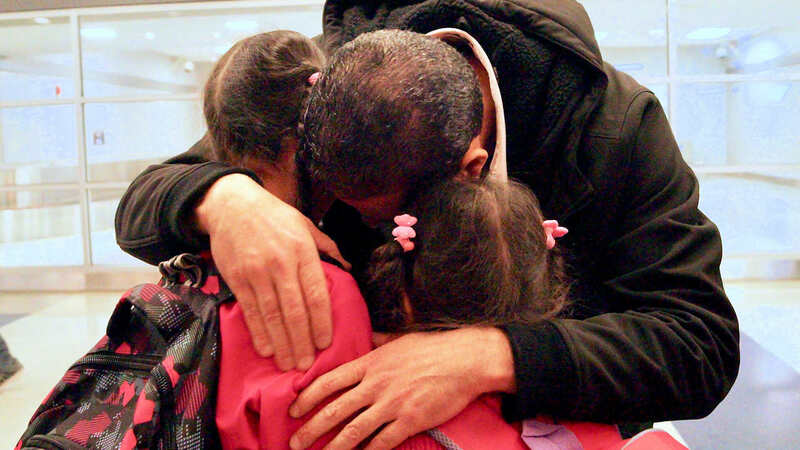 Instead, they had to return to Jordan, where they had been living since fleeing Syria. HIAS, a global Jewish nonprofit that works to protect refugees, immediately began working to assist the family. After several days of intense efforts, the family was able to safely reach the United States. In addition to raising the case in local, national and international media, HIAS brought together government officials, faith leaders and other influential figures to partner in the effort. "Unfortunately, this is just one of thousands of cases of innocent people who have been wrongly denied entry to the U.S.," HIAS CEO and President Mark Hetfield said. "We believe these are the first Syrians to enter since the executive order was signed, and we are determined to make sure they are not the last." The experience was harrowing for the father, according to brother-in-law Sam Karout. "He didn't sleep for two nights," said Karout, who is Syrian-American. "He was crying." The family had been making preparations to welcome the girls and their mother. "I have three kids, who had already bought gifts for their cousins," Karout said. "They were planning on going to JFK to meet them, and I couldn't have a logical explanation as to why they're not going, why they're not coming." Karout has lived in America for 30 years and runs a Middle Eastern deli in Milford. "I've been here for 30 years, this is the America I know," he said. "The America for human rights, freedom of speech, helping innocent, trying to distinguish between bad and good people in a logical way."